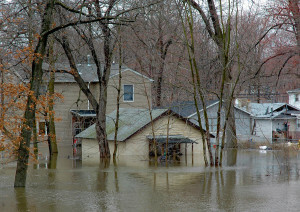 Whether you moved into your house 50 years or 50 minutes ago, water damage can be a serious threat to your home and family. It’s important for every homeowner to be aware of the warning signs, and be able to deal with these issues before they get out of hand. These 4 signs of water damage will allow you to spot trouble before it ruins your home, and help you find the professional fix you’ll need. The longer standing water stays in a structure, the more likely it is that bacteria, mold, and property damage will develop. If you need fishing waders to walk from the kitchen to the living room, you probably don’t need us to tell you that water damage is setting in. Call both your insurance company and Cal-Best Construction at 714.630.1180, as soon as possible. If a flood, broken pipe, or other source has pumped water into your home, Cal-Best will come to you any time—day or night—to assess the damage. We’ll have an estimate ready in 48 hours or less so we can get to work right away. While not as dramatic as a family room that doubles as a swimming pool, water stains can be just as damaging to your home. Look for discoloration around water sources, especially near toilets, bathroom and kitchen sinks, dishwashers, and refrigerators. 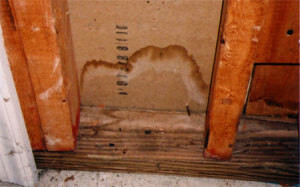 Even small leaks can build up in floors or cabinets over time and cause significant damage. Note: if you are considering purchasing a house and see water stains, ask for proof that the source of the damage has been repaired before moving forward. When wood or drywall absorbs water, walls and floors can start to swell or buckle before discoloration occurs. As Old House Web notes, these changes are noticeable when touching or walking over an area, and can be caused by something as small as a shower leak or as large as a major storm. Water damage isn’t always easy to see. It can occur under your carpet, behind wallpaper, in rooms rarely used or corners blocked by heavy furniture. Other signs are available, however—just trust your senses. Smell can be as clear an indicator of water damage as any visible water stain. If a room in your home smells of mold and mildew and you can’t find the source, call a professional. Mold can cause reactions in people with allergies or asthma, and even turn toxic if left untreated. Also, if you can hear water dripping from somewhere out of sight, this could indicate a leaking pipe or other source that could be causing damage already. If you can’t locate the leak, call a plumber for assistance and have a professional check for water damage. If you are looking for a new home, be wary of new paint patches that appear to have been added recently. Homeowners looking to sell might paint individual rooms or ceilings to hide water damage or other structural issues rather than fixing them. Contact us today with your water damage restoration project. For immediate help, please call us at 714.630.1180—or after hours, 714.392.6714, to reach our owner and principal, Justin Peister. We look forward to assisting you!